Has your hectic schedule caused you to neglect your skin making it look dull? Try Nerium International’s NEW IllumaBoost™ Brightening & Shield, with IIllumaBoost™ Brightening & Shield, you can fight discoloration and recover your healthy glow for fresher looking complexion. IllumaBoost™ Brightening & Shield With cleansed skin as a backdrop, IllumaBoost™ Brightening & Shield works to fight discoloration and brighten the look and even skin's appearance with a powerful, proven roster of age-fighting ingredients beginning with Nerium International's proprietary PhytoLumina complex, an exclusive blend of plant-based ingredients, plus niacinamide and vitamin C. Vitamin C, a skin-brightening ingredient, is sensitive and degrades over time. However, IllumaBoost™ Brightening & Shield unique dual-vial package seals the niacinamide and vitamin C blend in a separate chamber, preserving its freshness until use. IllumaBoost™ Brightening & Shield features a breakthrough delivery system that dispenses a fresh and potent dose of proprietary and proven ingredients—to help brighten, hydrate and protect skin—by simply adding a few pumps to any skincare product, or directly to one’s face. 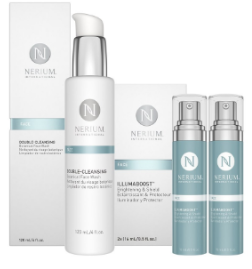 IllumaBoost™ Brightening & Shield ($80) now available for purchase Nerium.com and from an Independent Brand Partner in the U.S.
Usage instructions Press the pump down to open the chamber, releasing the brightening ingredients into the liquid. Shake the container until the formula is completely mixed. To use: Add 1-2 pumps of product to any day cream, night cream, serum, foundation or sunscreen. Use am and pm. Once activated, use vial (arrives two per package) within 15 days.